Once more we consider another female-fronted symphonic power metal band. This time it's Italy's Evenoire with their second album Herons. If recollection serves me correctly, of their debut album, I wondered if they had that something extra to break out of this crowded field. Perhaps that question should remain unanswered. Evenoire: she's king of the hill. If anything this album is heavier and more bombastic than it's predecessor, with with vocalist Lisy Stefanoni equally over-the-top, maybe even more so. A listen to Drops of Amber, Season of Decay, or The Newborn Spring will convince you of these things. Excepting the intro, Herons and maybe the bonus track Aries, Stefanoni's flute is seemingly non-existent, if not merely crushed by mountains of riffage and waves orchestra. Evenoire does dial things back a bit with When the Sun Sets, where folk elements highlight the song; that is, until it gets large and bombastic again. It's also a song that has one of the finest drum lines of the entire album. Another song with some lighter segues in several spots is The Lady of the Game, which also melds a nice rock groove to the heavy metal. Then Wild Females bookends the song with some light acoustic guitar. But in between those bookends, much like most every song on this album, everything is quite grand and bombastic. It appears the formula for this album, maybe to break out of the pack, was to go bigger and bolder. It just may work. Herons is a strong effort. 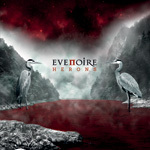 Italy's Evenoire returns with their second album, Herons, even bigger and more bombastic than before. They've definitely upped their game.